Every little girl feels the need to have at least two or three purses in her closet. They are one of the fashion necessities that cannot be denied. 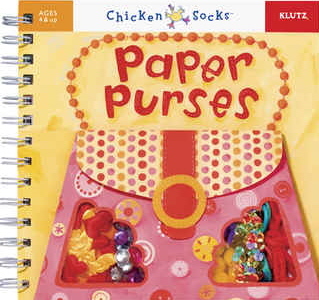 In this delightful kit little girls can decorate and fully accessorize four lovely little paper purses. There is a blue one with a built in handle, a purple one, a heart shaped one, and a pink one. To decorate the little purses the kit includes “fancy cording” for handles, jewels, pompoms, fabric puffies, stickers, and glue. Better still, the book that goes with the kit includes all kinds of suggestions on how one can use other craft items to decorate ones bags and how one can even make new bags with things that one finds around the house. Then there is the question of accessorizing. A purse that is empty is not very interesting so the creators of this kit have provided their crafters with five pages of accessories that they can punch out and put into their purses. There are money holders, photos, tickets, doll accessories, keys, money, a cell phone, lipsticks, and so much more. There are also two pages of punch outs of additional accessories: glasses, watches, rings, and tags to attach to ones purse straps. With the book to give them ideas and to show them how to attach cords and the like, and with all the fabulous gems, stickers and other goodies that are provided, little girls are sure to have a wonderful time with this clever little kit. Excellent photographs throughout the book show completed decorated purses and little girls modeling their creations, and young crafters are such to get ideas from these pictures. The instructions are easy to follow and the minimal, bouncy text is engaging and encouraging. This kit would make a perfect gift for a little girl who loves to make things.